Oh Sung-Moo is South Korea’s leading manhwa author/artist, raising to fame on the coattails of his mega hit W. One day his daughter, Oh Yeon-Joo, gets a call from Park Soo-Bong, the young man who works drawing backgrounds for the W series. He informs Yeon-Joo her father has been missing for some time. She brushes it off until he tells her that Sung-Moo’s keys and cell phone are still at the office/house. Feeling concerned and curious Yeon-Joo goes over to check on her father after work, however he still hasn’t shown up. While she is standing alone in his room, by his desk, a hand reaches through a computer screen and drags her in. When she comes to her senses she realizes she is now on a rooftop and there is a man on the ground, unconscious and bleeding from multiple stab wounds. She runs into the building to find someone to call 911 and then back to the roof, with a waiter trailing behind, to see if there is anything she can do for the man. Yeon-Joo’s doctor instincts kick in, realizing he’ll die if she doesn’t do something. She quickly grabs the waiter’s pen and plunges it into the man’s chest/shoulder area. That keeps him alive and while the ambulance crew is preparing to take him to the hospital Yeon-Joo hears the waiter and manager say the stabbing victim is CEO Kang Chul. Wait, that’s the name of the protagonist in her father’s comic book! While she stands there dumbfounded the words “To Be Continued” appear in the air and she instantly finds herself back in her father’s office. Soo-Bong opens the door and tells her there’s no need to be concerned about her father any more, the latest edition of W was just uploaded on the internet proving her dad is okay. He then sits her down in front of a computer and instructs her to read the new chapter while rambling on about how her father had planned to kill off W‘s main character but must have changed his mind. Yeon-Joo is stunned as she sees everything she has just gone through appear in the comic, exactly as it all happened. That’s just part of the first episode. There is so much more to this drama, where people go back and forth from the comic world of W to the real world. Kang Chul (the main character in the W comic book) became the nation’s hero by winning the gold medal in the shooting competition at the Olympics when he was just a junior in high school. But his bright future came to a screeching halt when he came home one evening to find his entire family had been murdered and he became the one and only suspect. He was arrested and given the sentence of capital punishment. At the appeals trial he was sentenced to life in prison, but later the Supreme Court sited the inadmissibility of evidence as a reason to acquit him and he was found not guilty and released. After spending a full year in prison he was finally released but the fact that he no longer had a family, and many people still considered him a murderer, was a great source of pain. After a year of living in misery as a free man he decided to end his life. Although a relatively happy little girl, Oh Yeon-Joo did have some sorrow in her childhood. Since her father, Oh Sung-Moo, was a failure in his chosen profession of being a manhwa author/artist he turned to alcohol for solace. Things became so bad that her parents divorced and she went to live with her mother, although still keeping a good relationship with her father. She is a second year resident of Thoracic surgery at Myung Sei Hospital but doesn’t hold her own physician skills in high regard. South Korea’s top and most beloved manhwa author/artist is Oh Sung-Moo, Yeon-Joo’s father. He had tried to make it in that profession but failed miserably until he created W, which was the comic series that catapulted him to fame and fortune. Each book, over 30 in the series, has sold 10 million copies. And that’s just the hard copies. The comic can also be found in its entirety online. Lee Jong-Suk, who plays CEO Kang Chul, began his career in the entertainment industry as the youngest male model ever for the Seoul Collection program for Seoul Fashion Week. He was a part of some of the biggest runway events and was called “a model who had the image of a boy and a grown-up man coexisting inside him.” For three months Jong-Suk trained to be a member of an idol group but quit after the agency he was with failed to keep their promise to debut him as an actor. Then in 2010 he made his first appearance as an actor in the Kdrama Prossecutor Princess, and thus began his zoom to stardom. Just three short years later he came in fifth place in the Actors Who Lit Up 2013 Gallup Korea survey. Apparently, that’s a very recognized entertainment industry award. Personally, although I’ve seen him in several other Kdramas, my favorite, without a doubt, is W – Two Worlds. Oh Yeon-Joo is played by Han Hyo-Joo and this is her first Kdrama in six years. She has been involved in feature films but W – Two Worlds is her Kdrama comeback. In 2003 she was discovered, while part of a teenage beauty pageant, and went on to act in the sitcom Nonstop 5. From there she was cast in the movie My Boss, My Teacher and then starred in the Kdrama Spring Waltz, which happens to be where I first saw her. She has received many, many awards and done tons of endorsements during her 13 year career. One thing I found impressive is the fact that she has been a goodwill/honorary ambassador for 11 different programs! I’m glad Hyo-Joo is back on the small screen and hope it doesn’t take her another six years to star in a Kdrama again. W – Two Worlds has been one of the most viewed Korean dramas of 2016 with a peak viewer rating of 17.8%. The storyline lasts 16 episodes but there is a 17th, chock-full of behind the scenes information. I love seeing bloopers and watching the actors as they film scenes. It also tells about the cartoonists, all the folks who did what must have been at least a hundred cartoon panel pictures for the show. There are wonderful special effects that happen throughout the drama and that extra episode talks about some of the CGI stuff we see. We also find out Lee Jong-Suk did all his own stunts and fight scenes in this show. It was fun watching him hanging from wires over the Han River Bridge while filming that pivotal scene. I regret I have to say I caught an editing/directorial mistake. It comes just a few minutes into the show – Oh Yeon-Joo is talking to Park Soo-Bong and one second her hair is tucked behind her ear and the next it’s not and then it goes back to being tucked and then not. It’s sadly obvious they put different takes of the same shot together. Too bad. The show is way too good for a silly error like that. Fortunately, the fact that it is such a brilliant drama helps to ease the disappointment of a minorly flawed scene. As for the soundtrack, it’s excellent. There are so many good songs. One of my favorites is an exquisite duet called Without You. The harmonizing voices of Yeoeun (from Melody Day) and N (from VIXX) blend beautifully together to compliment an already lovely song. Jung Joon-Young sings the beautiful song Where Are You and Park Bo-Ram is the artist that brings us Please Say Something Even Though It Is A Lie. We also get Basick and Inkii performing the rap ballad In the Illusion. When it first started playing I immediately thought of Auditory Hallucination from the Kdrama Kill Me, Heal Me. Both songs are very good but far too similar for me to call In the Illusion an original. Even their titles have a similar feel to them. (Illusion is a synonym for hallucination.) Urban Zakapa provide us with yet another wonderful ballad (they recently gave us No Way from the Kdrama Doctors) entitled Falling, sung solo by Jo Hyun-Ah. A++ for the soundtrack, folks. As far as scenery goes there’s not much in the way of jaw-dropping nature backgrounds but what we do get goes perfectly with the storyline. It’s big city stuff, both worlds, and the location scouts did a fine job putting the characters in places that match what’s going on. Besides, all the CGI stuff is what’s really interesting. I love it when Oh Yeon-Joo is alone in a restaurant bathroom and all of a sudden water starts rising and she finds herself underwater. It’s not what I’d call “scenery” but it’s definitely what I’d call “awesome”. 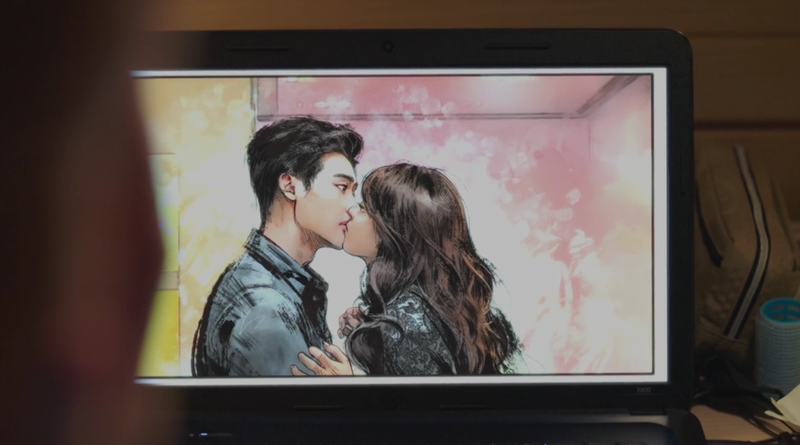 If you happen to be a romance lover I suggest W – Two Worlds. If you like action/adventure try W – Two Worlds. Are you in the mood for a fantasy? Choose W – Two Worlds. Do you want suspense? Turn on W – Two Worlds. In other words… make W – Two Worlds the next Kdrama you watch. You’ll love it!